Every time I say “Flea – A Lady’s Cardigan“, I laugh because . . flea! I’m not sure why the name and I haven’t read. The designer is Norwegian so . . who knows but I love this cardigan. It has colorwork and it’s steeked and you know I’ve been chomping at the bit to do a major colorwork project and I’ve really been wanting to do something steeked. 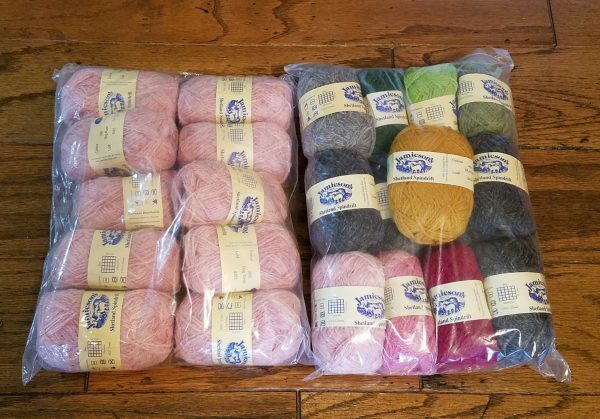 This yarn arrived yesterday and this is what I’m planning to use. The pink and gray will be the main colors and the other colors will be the colorwork parts. I think I may start that one as soon as I get both the test knits done. It probably will not be a quick project for me but maybe that will give me an indication if I really like doing a lot of colorwork or whether I just like the way it looks. Personally, I like the way it looks, but I don’t want to do it myself. Dealing with multiple colors and skeins of yarn is way too fiddly for me. I’ll just oooh and aahhh over other people’s projects. Yes, I read that and heard her talking about it but I would still not have named it Flea. Can’t wait to see this!! Looks like it is going to be beautiful!! I’m going to enjoy watching you knit this from afar. My taste runs more to ‘instant gratification’ and that sweater would take me a decade to complete!